In Greenland, the vast and varied effects of climate change are compounding. 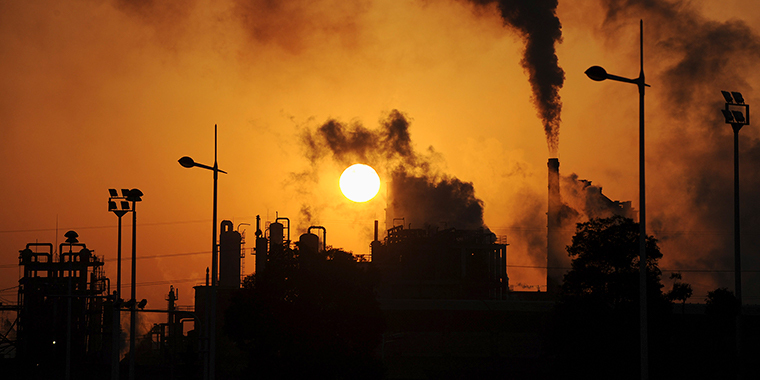 Smoke billows from chimneys at a chemical factory in Hefei in the Anhui province in China, on March 10, 2010. Climate change caused by greenhouse gas emissions can have many effects on regions across the world. Climate change is rapidly altering our world in profound ways. Human activity has already increased the Earth’s temperature by about 1.5 degrees Fahrenheit over the past century, and as the planet continues to warm, the dangers intensify. Millions of people could be displaced, vital infrastructure could be destroyed, and violent conflicts could multiply. Climate change’s effects are far-reaching, varied, and touch virtually every aspect of life on earth. They range from heat waves and rising sea levels, to desertification and melting ice, and even to mass extinction. The consequences of climate change are more complicated and connected than a simple list of weather events or ecological outcomes implies. For example, rising sea levels result in flooding, the destruction of infrastructure, and displacement, which can spur changes to the insurance industry and increase poverty, migration, and conflict. 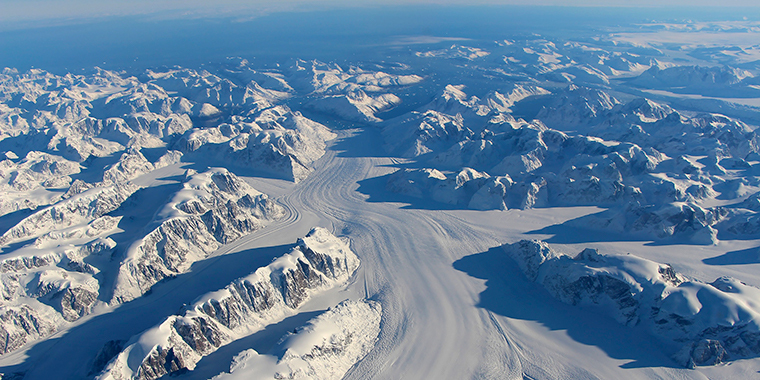 Greenland exemplifies the complexity of this issue: it’s melting faster than ever before. For thousands of years, sea level was more or less stable. But since the end of the 19th century, sea level has risen about 8 inches, and it’s getting faster: seas have risen more than 2 inches in the past 20 years alone. Why are seas rising? A major factor is glacier melt, and scientists are particularly concerned about Greenland’s melting. Greenland is an ice sheet, or large area of land covered in glacial ice. It’s one of only two in the world (the other is Antarctica). Heimdal Glacier in southern Greenland is seen in a NASA image captured by Langley Research Center's Falcon 20 aircraft, on October 13, 2015. Melting isn’t normally cause for alarm. It’s a seasonal process: ice sheets melt in the summer, and then typically regain their mass through snow that refreezes in the winter. But climate change has interrupted this process, with warmer weather for a longer portion of the year. 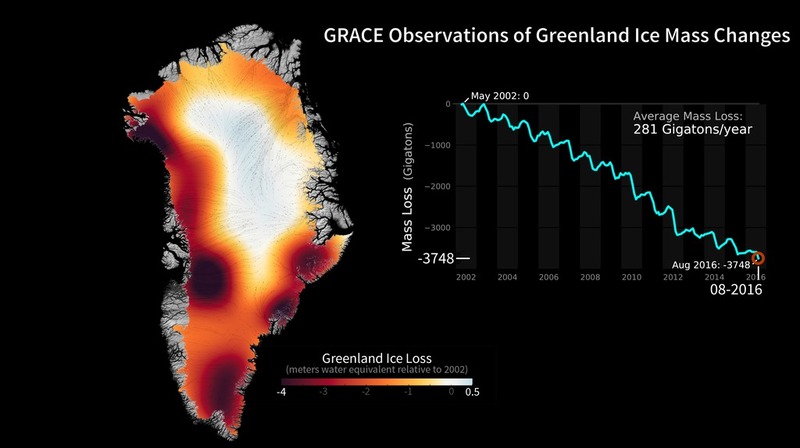 Greenland is now experiencing a longer melt season than normal, which means it’s shrinking. Think of it as a receding hairline: hair still grows, but not quickly enough to outpace hair loss. 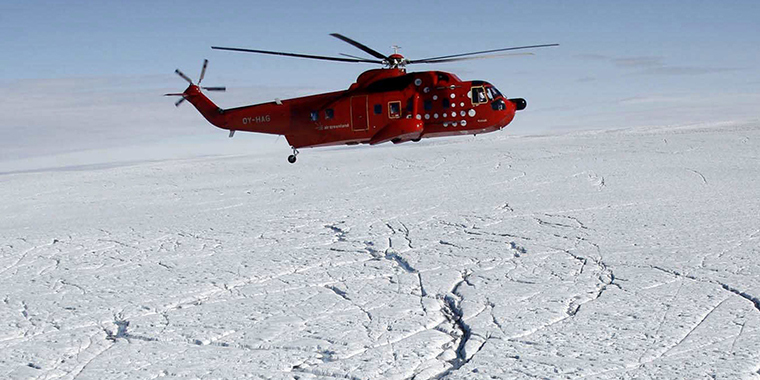 A helicopter carrying German Chancellor Angela Merkel and Environment Minister Sigmar Gabriel flies over the Eqi Glacier near the town of Ilulissat in Greenland on August 17, 2007. Not only is melt season now a couple of months longer, but more of the ice sheet is melting. Usually, about half the surface experiences melting, but in 2012, melt affected almost 99 percent. That year, Greenland lost more than double the mass it normally loses. More than a trillion tons of ice have been lost in Greenland since 2012--the equivalent of 400 million Olympic swimming pools. Most scientists agree that “feedback loops”—or self-reinforcing cycles—are occurring in Greenland. This means that as hotter temperatures spur more melting and longer melt seasons, two related consequences occur. First, older, darker ice is exposed. Like a black shirt soaking up summer heat, this darker ice absorbs more of the sun’s energy and accelerates the natural melting cycle. Second, meltwater also travels down moulins, or ice tunnels, that extend to the bottom of the ice sheet, and lubricates the space between the ice and the bedrock. This causes ice to break off and move more quickly out to sea. So, again, the more ice that melts on the surface, the more quickly glacier melt occurs. 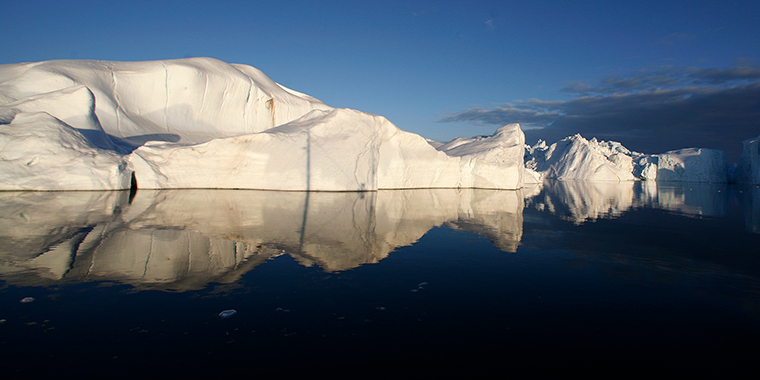 Icebergs are reflected in the calm waters at the mouth of the Jakobshavn ice fjord near Ilulissat in Greenland in this photo taken on May 15, 2007. As more water melts, it heads into the sea. And rising sea levels have their own adverse effects. Higher sea level threatens coastal cities, increases flooding and intensifies storms. This puts millions of people at risk: 40% of the U.S. population lives in coastal areas, and 8 of the world’s 10 largest cities are near a coast. This map shows coastal "urban agglomerations" and the percentages of their populations that could be inundated by rising sea levels if global warming reaches 4°C above pre-industrial levels. The United Nations' World Urbanization Prospects defines urban agglomeration as the "population contained within the contours of a contiguous territory inhabited at urban density levels without regard to administrative boundaries. It usually incorporates the population in a city or town plus that in the sub-urban areas lying outside of but being adjacent to the city boundaries." The percentages are based on the total populations of the urban agglomerations in 2010.